Jenise Aminoff is a writer who lives in Cambridge, MA. She works as a web designer, tech writer, and instructor. Her fiction has appeared in Dark Planet and in genrEZONE, and her poetry has appeared in Terra Incognita. In Gene Wolfe's Book of the New Sun, Severian the Torturer tells us that physical objects have meaning as symbols, meaning that transcends individual experience and in fact stems from the grand collective of human history. If Wolfe believes his own character, then he would have loved Myst and Riven, by Cyan Software. Myst remains the best selling computer game of all time, attracting a wide range of players, many of whom were non-gamers lured in by rich, textural graphics and intricate puzzles. The sequel, Riven, was built upon Myst's foundation and added astonishingly beautiful graphics, action sequences, and even more complex puzzles, all within a coherent, self-consistent plot. Now, as Cyan transforms itself into Cyan Worlds and focuses on gameplay across broadband internet (including the possibility of multiplayer games), they've farmed out the next installment in the Myst series to Presto Studios, makers of rather unremarkable games like Star Trek: Hidden Evil and Steven King's F13. Okay, they're good at working with other people's worlds. 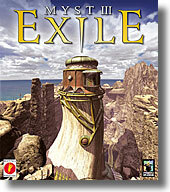 But can Myst III: Exile live up to the incredibly high standard that Cyan has set? Well, that depends on what you liked about Myst and Riven. Myst III does do an excellent job of recreating the stunning graphics and atmosphere of exploring an entirely alien landscape. Some of the worlds are downright disturbing, including a world in which you regularly interact with weird living things, both flora and fauna, in a landscape that looks like wind- and water-worn bone. Similarly, if you like puzzles, you won't be disappointed by the plethora of tricks and teasers of varying complexity. One major advantage of Myst III is that it uses a completely immersive interface. While you'll still step from frame to frame as before, you can now look 360 degrees around you, up and down and sideways and slantways and any ways you can think of. While this sometimes makes it difficult to manipulate objects like journals, you can simply hold down the shift key to release the cursor. Not everyone will think this is an improvement, however. My husband gets thoroughly motion sick after watching me play for just a few minutes. Sound is also an important component of the game. The soundtrack expands on its predecessors and includes an interesting range of styles. I'm particularly fond of the music with Middle Eastern influence. In a few places, I found vocal background music jarring and kept looking around for the source of the song. Sound plays an integral part in several puzzles, so make sure your sound system is up to snuff. I played Myst III on a Macintosh G4 with OpenGL. If you're on a Mac, make certain you go to www.apple.com and get the latest version of OpenGL to install. After having been stumped by the final puzzle in Riven because I couldn't distinguish a couple of sounds, I invested this time in a surround sound stereo system from Cambridge Soundworks. It made a huge difference and helps to immerse you in the game. And I'll admit, I love cranking up the subwoofer for an extra dose of musical angst. Having said all that, Myst III does lack one important feature: a driving plot. In Riven, Cyan broke new ground by integrating their puzzles into the culture of the people in their ages and the character of Gehn, the game's villain. The plot, to capture Gehn and save Catherine, gave Riven a mood of urgency and purpose that Exile lacks. In Myst III, Atrus's latest creation, in which most of his people, the D'ni, now live, is stolen by a victim of Atrus's wayward sons, Cirrus and Achenar, featured in the original Myst. The victim, Saavedro, is on a quest for revenge on Atrus (played by Myst co-creator Rand Miller) for allowing his sons to destroy Saavedro's home. He leads you on a wild goose chase through five worlds just to get Atrus's book back. But the brilliant moments of character interaction that made Riven so riveting are missing from Myst III. Aside from the occasional recording of Saavedro taunting Atrus, you're left alone to muck about in the worlds as best you can. Even more striking, though, is the lack of semiotic content. Riven did an amazing job of reinforcing the plot with visual symbolism and mood-setting. One scene in Riven, a spidery gold cage in a dark room of rough hewn stone, literally made me jump out of my seat. By contrast, Myst III is merely beautiful and mysterious. Wandering around the initial world, J'nanin, in which Saavedro claims to have been trapped for so long, you start to wonder what his problem was, living on an island of Frank Lloyd Wright-ish stained glass and cute little white bunny-like creatures. Where is the devastation caused by Cirrus and Achenar? Where is the aura of loneliness and abandonment? And why all the cheerful choral music when you're nearing the lair of a grief-crazed psychopath? Presto Studios has done an excellent job of imitating the style of Myst, but it has failed to capture the substance. Where Myst and Riven are guided by narrative, Exile is guided by a deep need to reproduce the real thing. Myst and Riven are among my favorite examples of multimedia, interactive storytelling. The visual language Cyan uses draws you in on a semiotic level that rivals the fiction of Gene Wolfe. Without that visual narrative, Myst III is just a game. Still, it's a really good game with a lot of engrossing play and satisfying problem solving in it. In my opinion, it's a better game than just about anything else on the market right now, and it certainly makes for a satisfying stopgap while we wait for Cyan's next project, a non-Myst 3-D Internet-based game, code named Mudpie, to reach completion.